The year is still brand new, and in this season my mind hums with thoughts. Always, I want to be better at whatever I do. It’s in my DNA. I’m wired to strive towards excellence. These days I’m reading more, spending time fine tuning the behind-the-scenes parts of the blog, learning, and dreaming. I’ve also taken a back seat to my online social activities, which I sort of miss. It’s all part of this internal drum in my heart and head to thrive. I know all that sounds like I’ve got a map and charted my next steps, knowing where I want to go. Lately I’ve been chewing on the idea of writing an e-book or maybe (gasp!) an e-course of some kind. You can be assured that it won’t be a recipe or cookbook. That I know for sure. I do enjoy cooking in the kitchen and I can teach you how to make oodles of meals from one chicken… but that’s about it. There are other things which I think might be more helpful to womankind. At this point in my life I have a tendency to see my short-comings more than my long-comings. Is there such a word? That’s why I thought I’d ask you for your help. This crazy idea popped into my head. Maybe if I knew your concerns, your challenges, the areas in which you’d like help or need help… maybe all this could be a win-win. I’m not saying I’m the answer lady. But, I do a pretty good job at researching and teaching and I’ve written more than a few tutorials. Right now I’m staring at a nearly blank sheet of paper. I’ve written some categories across the top of the sheet. You’ll find all of them in the menu on the blog header. But, that’s it. Those are the topics I’ve covered in my more than 2 years of writing here at An Extraordinary Day. If you click down on them you’ll see plenty of sub categories, too. (Hopefully in the next several days those sub categories will all be filled with posts to make navigation here on the blog easier.) If you haven’t already had an “ah-ha” moment… maybe one of these will trigger something in your thinking. Truly, I appreciate your help, insights, and of course, even more learning about your personal challenges. This year I want to keep moving forward with excellence. But even more… I want to thrive. I want you to thrive. To download this 8×10 image, click here. There’s one thing I must say…. thriving is not my mission in life. My mission is to honor and glorify God with all I am. That being said, we can easily slip into the spot where we spend our lives treading water, trying like crazy to keep our heads above the water, hoping to survive. I know!!! 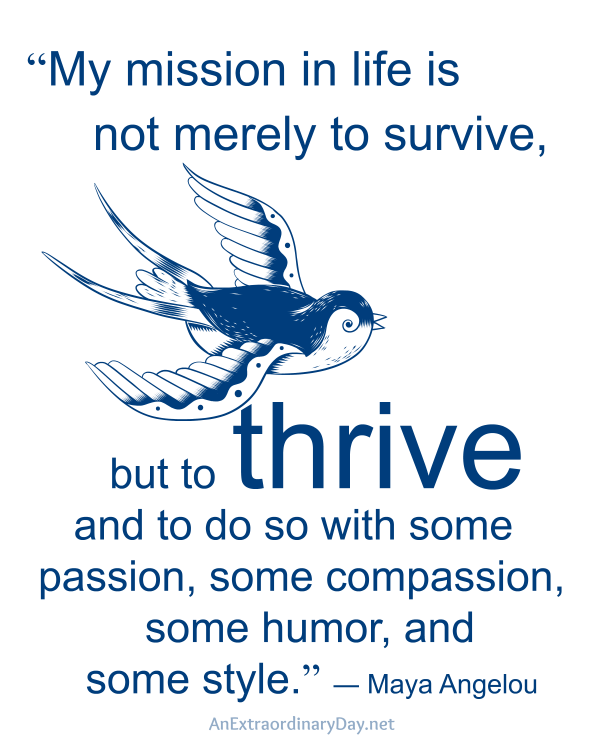 This year… let’s get out of survival mode and strive to thrive! I cannot wait to read your thoughts and insights! I do not know. How to say what I want in a book. Is it because parts of my brain are just gone?? I don’t view this world correctly? I do not know. Is it my age? My constant year of trial after trial of great magnitude? Yet I feel like when I walk with my Walker. I’m always correcting it to not veer to the left. Keep correcting, straightening my pathway’s steps. That’s kind of where I am. Like I look around and don’t know what to focus upon. Yet lists I make. Maybe a gentle quiet peaceful book of beauty. No yelling. No Do this!!! Peaceful. Gentle. Soothing. That anyone could pickup and relate to whether happy or sad. Brain damaged or whole. And the theme? Centered upon Gods love through(shown) JESUS… Hope. Joy. Love. Patience. Kindness. Goodness. Gentleness. Faithfulness. That kind of book that uses your photos and Gods Word in such gentle peace ful ways. Page after page. Sharing your heart for God through a book of devotionals, testimonies, photo’s, inspirations, struggles, etc. You have so much to share. I’m certain we will all enjoy what ever it is that God has for you to share. I agree with Gwen & Shirlene. Your photos coupled with “truths” and your added words are such a great inspiritation and catalyst for every day living “to the fullest.” I look forward to your every email! Blessings to you and prayers. Like everyone else who has posted a comment, I love your blog, as in I am addicted to it, and I get a lot of fulfillment from it as it is now. I have’t written sooner because I needed to think about all of this that you have shared with us thus far. Would it be possible for you to have an online bible study option on your blog? Quite frankly, I have never been to a bible study so I am pretty green when it comes to this topic, but I can’t think of anyone I would rather study the bible with than you! Maybe this is a long shot, but it just came to mind and I thought I’ll never know how you feel unless I ask! All the above ideas are terrific, and if anyone could pull it off it would be you! You are such an inspiration to so many….bless you for caring enough.